The Wolf Tree Trail at Smith Rock State Park is great for watching climbers as you go around the rock walls. 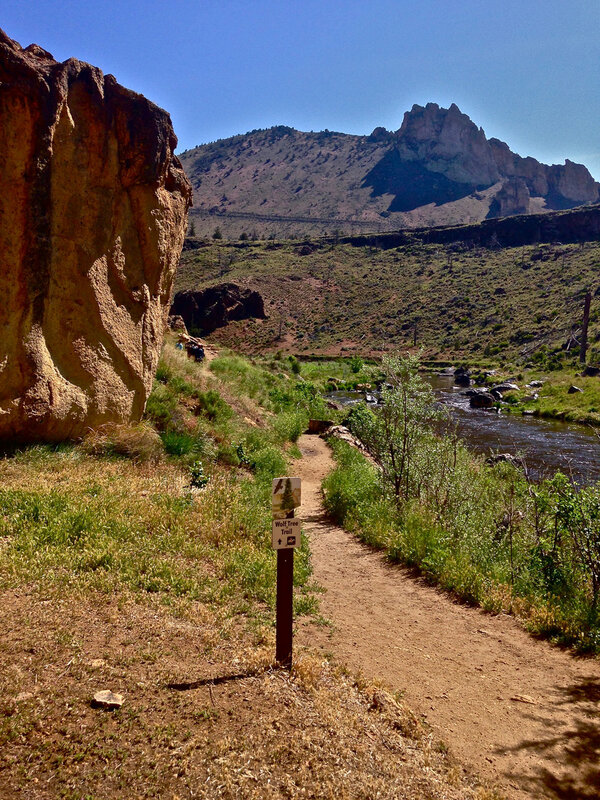 The Wolf Tree Trail follows the Crooked River at Smith Rock State Park toward the Monument area. A giant ponderosa along the Wolf Tree Trail provides a nice bench in the shade to watch the wildlife at Smith Rock State Park. Shade trees are plentiful along the Wolf Tree Trail for those hot summer days at Smith Rock State Park. Horses fording the river from the Homestead Trail enter the Wolf Tree Trail to then head up to the Burma Road outside of Smith Rock State Park. The Wolf Tree Trail pops out of the trees to great river views at Smith Rock State Park. The Wolf Tree Trail goes past giant rock pinnacles on your left where golden eagles nest at Smith Rock State Park. Heading up and away from the river on the Wolf Tree Tree at Smith Rock State Park watch your footing on the scree surface. The Wolf Tree Trail continues to climb gently away from the river at Smith Rock State Park. The end of the Wolf Tree Trail at Smith Rock State Park forks up to the steep Burma Road Trail, or you can go along the Student Wall and see river views along the gorge. NOTE: Horseback riding is restricted between the bridge and the horse ford. Access for riders on the Wolf Tree Trail is via the Homestead Trail and then by crossing the river at the horse ford. Immediately looking up to your left, you see climbers on the popular Picnic Lunch Wall. The Ship Rock formation and Red Wall climbing area are next as you follow the trail along the river. Geese, ducks, and the occasional blue heron frequent the area, as well as the two-legged fish seekers fly fishing the river. Next, you come upon a huge ponderosa tree that offers a break from the heat of the summer. It’s also a great place just to hang out on the bench below it. As you round the bend and go past the horse ford, you come into the Monument area. Always open for hiking, it’s also a popular climbing area when it isn’t nesting season for the golden eagles that construct huge 6-8 foot nests on the rock faces. You may want to pack your binoculars. It’s a great area for watching raptor activity of all sorts. Continuing past the Monument, you start to ascend gently across a rock field then up some more on to scree until you reach the Burma Road junction. You can turn around at this point, or explore some more by seeing the TIP below. Want to explore more of the river canyon? When you reach the signage to the Burma Road Trail, follow the sign left and then go right at the Student Wall sign and up to the top of the Student Wall climbing area. The ridge along the river gorge provides some great views below.